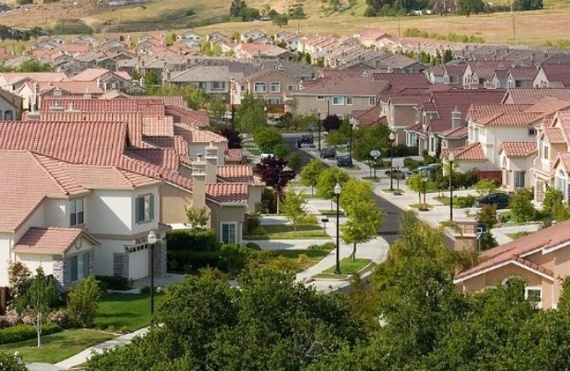 The Article: Are the Suburbs Making People Live Paycheck to Paycheck? by Matthew O’Brien in The Atlantic. The Text: Most people living paycheck-to-paycheck aren’t actually poor. They make a decent amount, and they have a decent amount of wealth. Now, you might expect that people without any liquid savings like cash or checking accounts wouldn’t have any illiquid savings like housing or retirement accounts, either. Basically, that everyone follows Suze Orman’s advice, and builds up an eight month emergency fund before putting any money into investments. But a new Brookings paper shows that this isn’t the world that we live in. The researchers found that about 33 percent of households have very few liquid savings, but, of those, about 66 percent have at least $50,000 in illiquid savings. In other words, someone living “hand-to-mouth,” as the authors put it, is twice as likely to be middle class as poor. And, as you can see below, that’s been true throughout the past 25 years. So who are these wealthy cash-poor people? Well, they tend to be older, married, and better-paid. You can see some of this in the chart below. Most poor hand-to-mouth people (the red line) are younger, peaking around 22 years old and then falling rapidly from there. 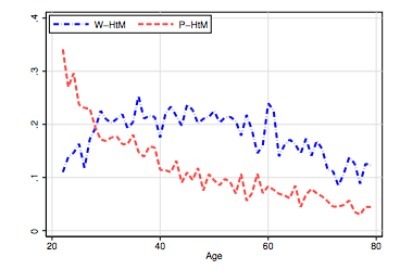 But most wealthy hand-to-mouth people (the blue line) are in their 30s, 40s, and 50s. It’s a U-shaped distribution: there aren’t many young people who are wealthy and cash-poor, it goes up as people hit middle age, and then it falls as people get to retirement. This has big policy implications. For one, school vouchers might be a good idea to cut the link between housing and education. That could keep so many people from becoming cash-poor and wealthy—a precarious thing—in the first place. For another, it tells us that we shouldn’t phase out tax cuts quite so much when we’re doing stimulus. Economists typically think that richer people are less likely to spend, say, a tax rebate, because they have fewer things they need to spend on. But that’s not true for the wealthy hand-to-mouth. They’re almost as likely to spend as poor households. In any case, it’s a frightening reminder that there’s nothing riskier nowadays than trying to live a middle class lifestyle.